Re: Tom Cruise v. Bauer Publishing, et al. 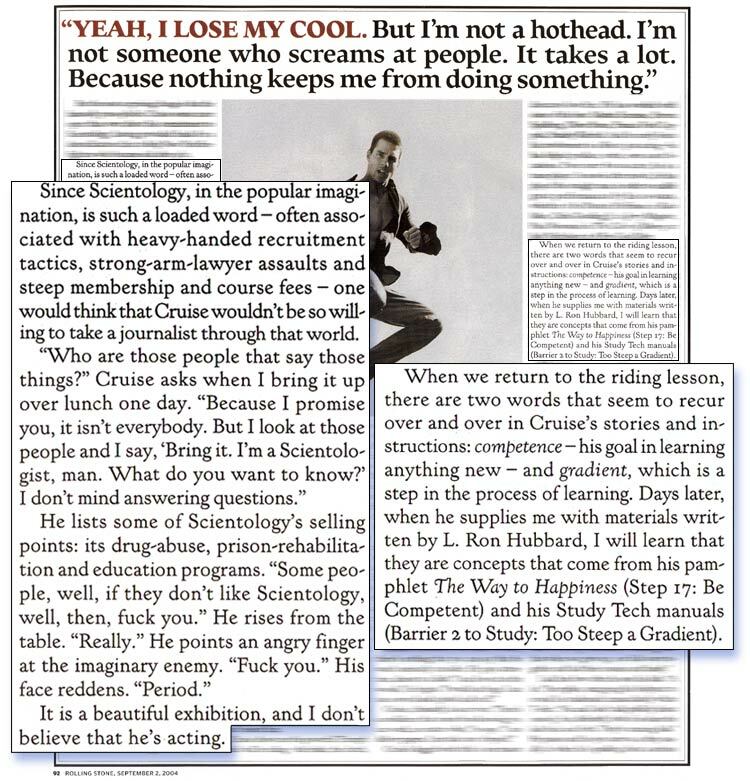 Tom Cruise speaks on what it means to be a Scientologist, the Keeping Scientology Working and the Suppressive Person doctrine. But if that’s what Mr Cruise has brought to this world there still remains one more word on the man. Call it Tom Cruise on Tom Cruise, Scientologist. I think it’s a privilege to call yourself a Scientologist and it’s something that you have to earn and because a Scientologist does. He or she has the ability to create new and better realities and improve conditions. Uh, being a Scientologist you look at someone and you know absolutely that you can help them. So for me it really is KSW and it’s just like, it’s, it’s something that uh, I don’t mince words with that. You know with, with anything that LRH says but that policy to me has really gone ffff boy ahrahmaby. There’s a time I went through and I said, ‘You know what?’ When I read it ah you know I just went phooo this is it; is exactly it. Being a Scientologist . . . When you drive past an accident, it’s not like anyone else. As you drive past you know you have to do something about it because you know you’re the only one that can really help. But that’s . . . that’s what drives me is that I know that we have an opportunity and uh to really help for the first time eff-effectively change people’s lives and ah I am dedicated that. I’m gonna I’m absolutely uncompromisingly dedicated to that. Orgs are there to help. OK but we as you know as also the public it’s like we have a responsibility. It’s not just the orgs. It’s not just Dave Miscavige. You know it’s not just not just me. It’s you. It’s everyone out there kinda sss rereading KSW and looking at what needs to be done and saying OK am I gonna do it or am I not gonna do it? Period. And am I gonna look at that guy or am I too afraid because I have my own out ethics to put in someone else’s ethics? And that’s all it comes down to. ‘Cause I won’t hesitate to put ethics in on someone else, you know, ‘cause I put it ruthlessly in on myself. And I think that aah I respect that in in others. And uh you know I’m there to help and we’re here to help and my opinion is is that look, you’re on board or you’re not on board. OK? But just if you’re on board, you’re on board just like the rest of us. Period. We are the authorities on getting people off drugs. We are the authorities on the mind. We are the authorities on improving conditions. Criminon. We can rehabilitate criminals. Way to Happines; we bring peace. Uuh-an and unite cultures. Uh. That once you know these tools and you know that they work it’s, it’s not good enough that I’m just doing ok.
Travelling the world and meeting the people that I’ve that I’ve met, you know, talking with these leaders in di various fields . . . they want help and they are depending on people who know and who can be effective and do it and that’s us. That is our responsibility to do that. It is the time now. Now is the time. OK? It is being a Scientologist people are turning to you so you better know it. You better know it. And if you don’t you know go and learn it. You know. But don’t pretend you know it and or foo or whatever. It’s like we’re here to help. I mean if you’re a Scientologist you see life the you see things the way they are in all its glory you know? All of its complexity uh and the more you know as a Scientologist you don’t become overwhelmed by it. And uh <couldn’t hear it> you know she . . . They said, “So like have you met an SP?” And I looked at them and ah you know and I thought, how what a beautiful thing because maybe one day it’ll be like that. You know what I’m saying. Maybe one day it’ll be that – Wow SPs! Like they’ll just read about those in the history books, you know? I wish the world was a different place. I’d like to go on vacation and go and romp and play and just do that. You know what I mean? I mean that’s what I want it to be. OK? That’s how ah I you know and there’s times I’d like to do that but, but I can’t. Because I know. I know. So eeh eeh you know once you know, you just khe I have to do something about it. It’s not . . . you know you can sit here and wish it was different and then you look at it and you say OK this is it, alright OK and there’s that moment when you go, you know, I have to do something don’t I? Yeah, I really have to do it because I can’t live with myself if I don’t and it’s, and that really is it. I don’t care if someone thinks it’s hard or easy, it’s ei, either helping and contributing everything you can or you’re not. OK? Uuh because I’m carrying my load. Alright? And not only that as much as I’m carrying I still feel like I gotta do more. Alright? There’s still a thing of: Let’s go! You can just see the look in their eyes you know the ones that are doing, you know, and you know the spectators who are the ones that are going, “Well, it’s easy for you, or what am I doing” and it’s just . . . that thing is uh, I’ve cancelled that in my area – where my . . . It’s either man you’re either in or you’re out. That’s spectatorism and it’s something that, that is, we have no time for it now. So it’s our responsibility to educate, create the new reality. You know we have that responsibility to say, “Hey! This is the way it should be done. Because we do it this way and people are actually getting better. And, let’s get it done. You know, let’s really get it done and have enough love, compassion and toughness that that you’re gonna do it. Uuh and uh do it right. And I have to tell you something. I really i-i-it is you know it’s rough and tumble. Ah it’s wild and wooly and it’s a blast. It’s a blast. It really is fun. Because, damn it there’s nothing better . . . than to going out there and fighting the fight and suddenly you see pwoo things are better. I want to know that I’ve done everything I could uuh every day. And I think about those people out there who are depending on . . . us. And uh, I think about that. And it does make me feel like man yer gotta get thers you know? We got more work. I need more help. You know get those spectators – you’re in the playing field or outa the arena. You know? That’s how I really that’s how I feel about it. I do what I can. And I do it . . . the way I do everything. There’s nothing part of the way for me. It’s just phoo! A Scientologist can be defined by a single question: “Would you want others to achieve the knowledge you now have?” In answering that question, Tom Cruise has introduced LRH technology to over one billion people of Earth and that’s only the first wave he’s unleashed, which is why the story of Tom Cruise, Scientologist, has only just begun. “That’s what’s most interesting about him to me. It wasn’t like I wanted to play a villain. I get offered a lot of different things and I just had a visceral reaction to this character. “Vincent is an anti-social person, no question. And to be truthful, about two-and-a-half per cent of the population is anti-social. 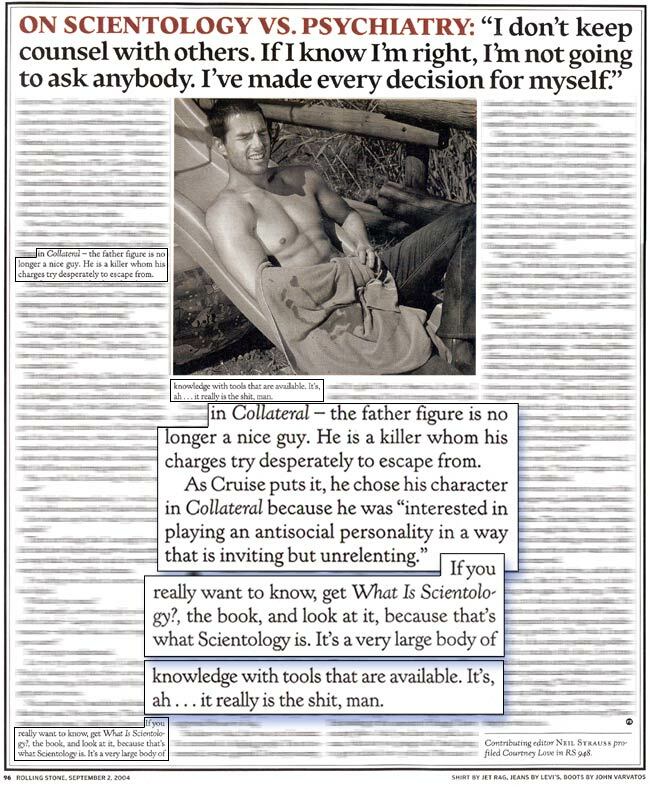 This is Tom Cruise, the Psychiatrist, talking. 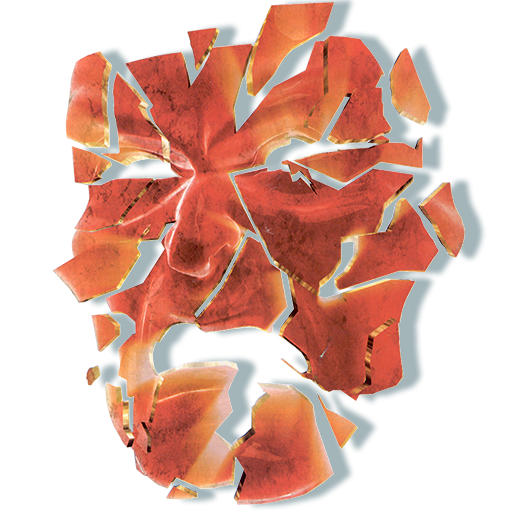 His psychiatric knowledge, or truthfulness, that 2 ½ percent of the population is antisocial, or SP, comes right out of the psychiatric case of L. Ron Hubbard. Don’t be nice. Limit their reach. And have less noncompliance and a far more effective and happier org. After all, real suppressives only constitute about 2 ½ percent of the total population. Why spend more than 2 ½ percent of your time on them? In a normal group of 400, the actual percentage of R/Sers is low. It’s about 8 in 400, or 2 – 2 1/2%. Those figures should seem familiar. They are the same percentage for SPs. And that gives you a clue to the identification of an R/Ser. What would LRH do? He applied ethics. He applied this tech to his life 100%. What does the tech say? 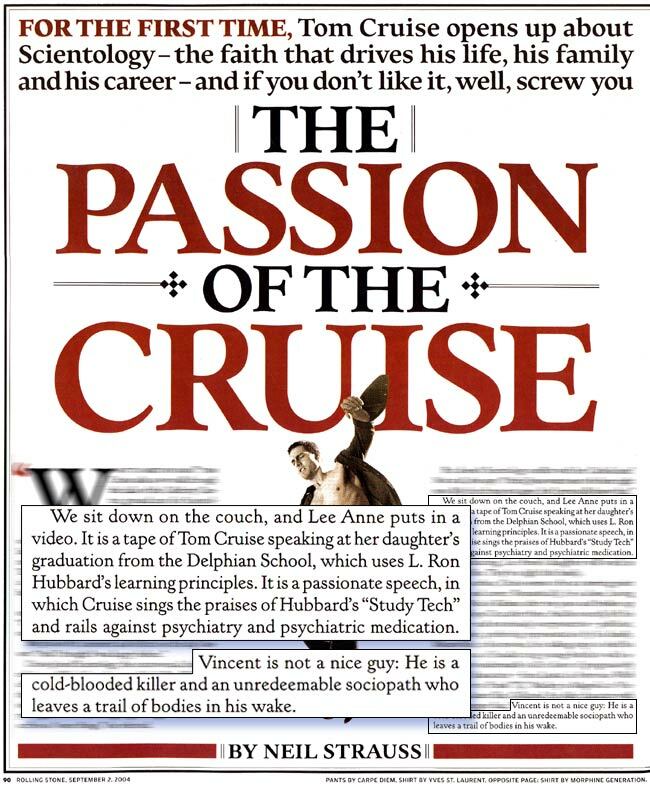 There is not the slightest doubt that what Cruise is bringing in his celebrity interviews, and in his discussion of his role as murderer Vincent, the antisocial bringer of chaos, is the Suppressive Person doctrine. This doctrine, while ludicrous, is also dangerous, and particularly hazardous to people who have understood the doctrine well enough to grasp its ludicrousness. The SP doctrine is the key to Scientology’s apparent successes, and because of its inherent ludicrousness and evil is also what will bring this organization to its knees.